This piece was made in response to viewing Ken Howard’s painting “Ulster Crucifixion” (1978) in the Ulster Museum. It discusses not only the emotions of a mother and her relationship with her child, but our society’s relationship with this land. The dress has text taken from transcripts of recorded conversations between mothers and their children, stitched in black across it. The apron is made from handmade papers and finely woven lace and fabrics moulded together. The houses along the hem are made from different cloths screen printed with imagery from newspaper headings from 1912-2000 and ordinance survey maps. Found fabrics, religious and political cloth items were also used. 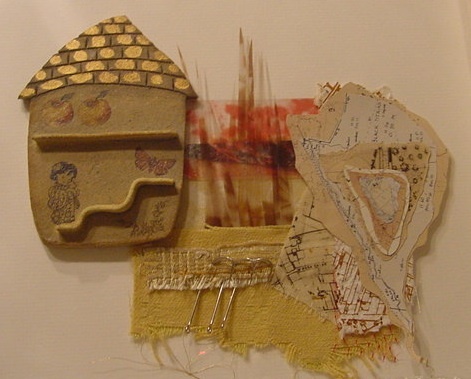 This piece was exhibited at the Island Arts Centre, Lisburn (2004) as part of a group exhibition in which artists were asked to produce work which was influenced in some way by a piece from the Ulster Museum’s collection. This solo exhibition at Island Arts Centre, Lisburn, explored the relationship between mother and child. 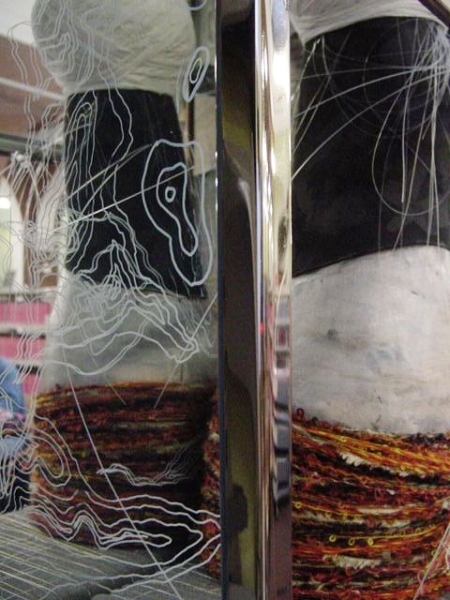 Other works included large scale textile artworks, ceramic sculptures, mixed media prints and kiln slumped glass forms. 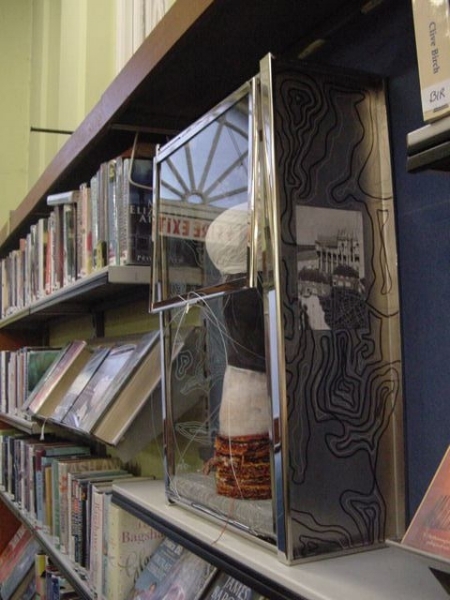 Artists from Ireland and the UK where selected to produce a piece of work which could be placed within Cork City Library – obvious or hidden to the library’s visitors, which would cause them to see or experience the space differently. I wanted to produce a three dimensional story or narrative that suggested the role we play in our society can never be passive or neutral. The ceramic figure is encased within a glass and steel container and bound by string. In order to view the figure the onlooker will always see themselves reflected in the mirrored back, this along with the map contours printed on the glass surfaces alludes to the fact that we are all active participants in our environments by our very presence. How we choose to ‘act’ is telling. This exhibition explores perceptions and experiences of our personal environment. In tracking our movements and making them visible we can begin to see and explore the boundaries of that space and understand its construction and our presence within it. The experience is moulded further by our personal and shared past, present and future. What does the present need to be informed of from its past in order to affect its future?